While I’m at my Weight Watchers meeting bright and early on this fine Saturday morning (fine, if the rain Ever goes away!) you can all enjoy the weekly fun of Snapshot Saturday, hosted by Melinda at West Metro Mommy. This is the place to be to see and be seen if you like taking and sharing your photos. If you’re inclined, link up…we’d love to see your photos, too! I have just a few photos left from my day at the local nursery. I almost forgot about this one because it’s not flowers, but it did catch my eye and the more I look at it the better I like it. I’m not completely sure if it is the sun or the moon. I’m a moon fan so I like to think it’s the moon. It probably is when you look closely and see all of the craters. I just realized that if you look closely (again), you can see my reflection in the pot on the left. How funny. I don’t know how many times I’ve looked at this and I never noticed it. Does that count as a self-portrait?! I think it should! Be sure to check out the other wonderful photos at West Metro Mommy and be sure to leave some comments! This entry was posted in Uncategorized and tagged photography, Snapshot Saturday, Weight Watchers. Bookmark the permalink. I like this stern moon. Or sun. In any case, he seems ready to scold, I think. I think I agree with you, Deb! I think he would look wonderful peeking out from a wall covered with clematis or ivy! I do too, Susan. He needs a place in my yard! Sorry to scare you, Diane! Thanks, Laurel, glad you like it! What a fun photo safari site the nursery turned out to be! I need to try that! No Idea why I thought of it, Joy, but it did turn out well! Nurseries are fun places to take a camera. And yes, that is a self-portrait! Thanks, Jackie! I never thought about photos at a nursery until that day. Thank goodness, I had my camera with me! It was a good idea that “just happened.” I’m thinking of visiting again! I like the sun/moon. 🙂 Thanks. Thanks, Elizabeth, glad you like it! 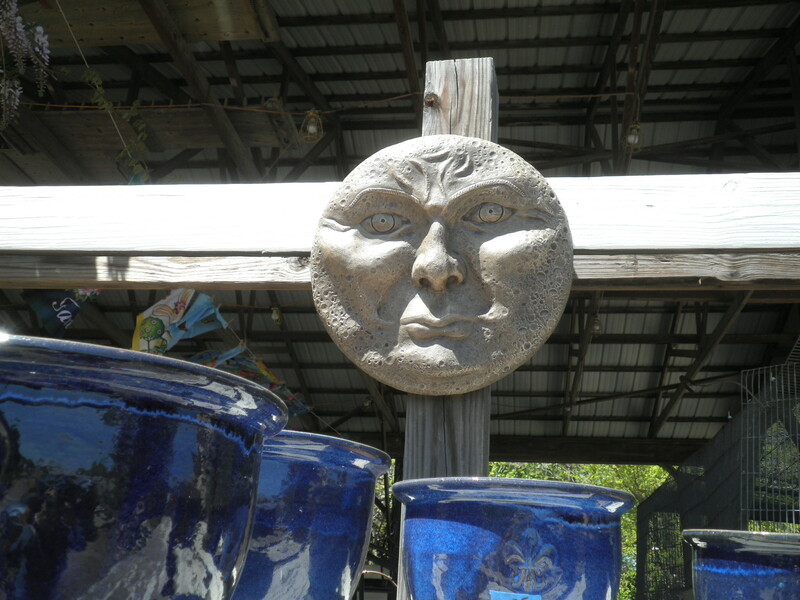 Love the sun/moon, and that face! well just plain scary. Yes, Irene, he is a bit scary, but as I told my sister…I like to think that the sun is in his eyes and he’s squinting! Have a great day! He looks rather stern to me. I’m going with Moon. The sun would smiling and he seems rather grumpy. I think he’s concentrating, Leslie or the sun is in his eyes! !